In last night’s episode of Saturday Night Live, hosted by Cameron Diaz, the opening sketch hilariously poked fun at President Obama for his recent use of executive authority on immigration reform, notably without involving Congress. The sketch was a brilliant spoof of the 1970’s ABC educational series Schoolhouse Rock!, which created the now legendary animated song “I’m Just a Bill” in 1975 to help American children learn about the legislative process on Capitol Hill. The SNL sketch features Kenan Thompson playing a “Bill” who dreams of one day becoming a law. 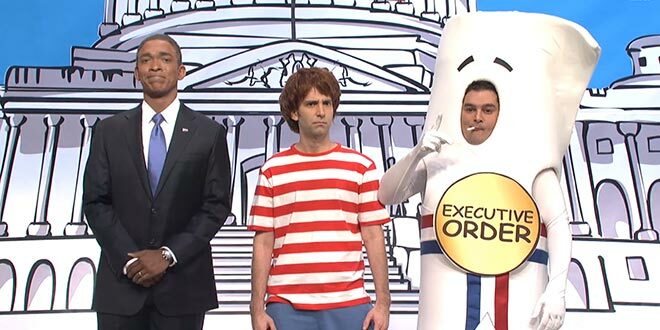 President Obama, played by Jay Pharoah, enters the scene and proceeds to push Bill down the steps of the Capitol in favor of the “Executive Order,” played by Bobby Moynihan, who avoids the ratification process altogether and just sort of materializes at the President’s whim. It’s all in good fun, although it must have struck a chord with the left because both The Washington Post and Think Progress published articles explaining what the skit “got wrong.” Sounds like it got everything right to me.